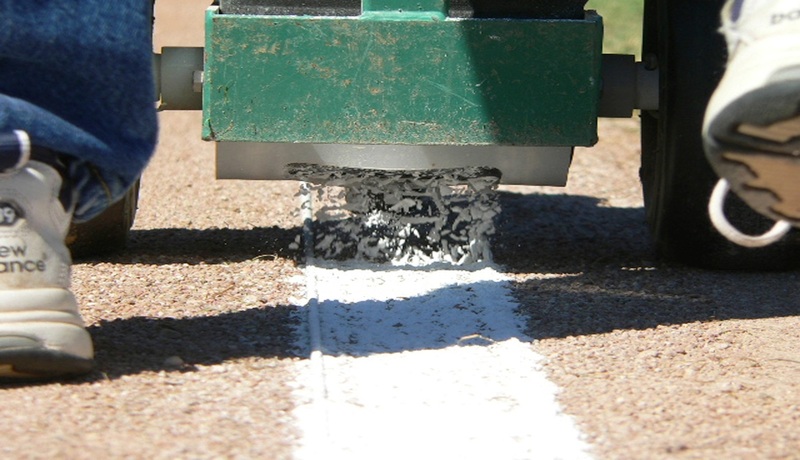 Dry line products used for marking lines on ballfields usually come from one of two types of stone, limestone or marble. Limestone is a sedimentary rock while marble is a metamorphic rock that is formed when heat and pressure are exerted on a limestone deposit, such as during the formation of mountains, and the limestone transforms into marble. Both of these stone products are high in calcium carbonate, which helps to give these materials a white or off-white color. Dry line marking material that is produced from sedimentary limestone is generally a softer material and flows more slowly through a dry line chalker. Limestone-based chalk is produced in many areas all across the United States which tends to make it more widely available. Conversely, marble is a harder, purer marking material that tends to flow faster in a chalker. Marble chalk is produced in more mountainous areas of the US, primarily in northern Georgia and western Colorado. Since both chalking materials are stone products, their particles will be fairly angular when crushed down to fine powder. This angularity usually is not visible to the naked eye, yet has a significant effect on flowability of the fine powder through a dry line marker. 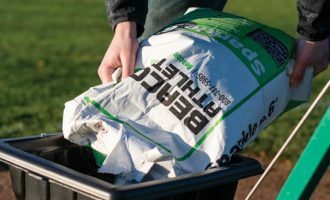 Frequently, groundskeepers will blame moisture as the culprit for their chalking material bridging in the hopper of their chalker. However, the main reason chalk bridges is because the angular particles will slowly interlock with each other as the chalk slowly settles out in the hopper. When you first pour a bag of marking chalk into the hopper, air is infused into the chalk powder, which makes it flow more easily as the air takes up space between the particles. As the chalking unit is pushed along the ground, the vibration shakes the hopper and slowly the air is removed from the chalk. This allows the material to settle and interlock, thereby impeding the flow of the chalk through the hopper. 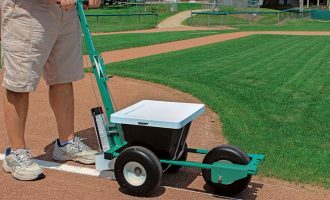 It is always Beacon’s recommendation to fill your chalker’s hopper at the home plate circle and only place the amount of chalk needed to line that particular field. Usually 25 to 35 lbs. of marking chalk is sufficient enough to properly line a ball field. As mentioned earlier, the different marking chalks move at different speeds through a chalker. Marble flows faster than limestone chalk. To correct for this, it is critical to have a chalker that has an adjustable flow control to enable the operator to meter out the desired thickness of chalk. Many dry line markers only have an on-off lever to control the chalk. These are either open or closed with no additional adjustment for chalk flow control. The Streamliner Dry Line Marker is one of the very few that allows a range of openings in the drop slot to allow the operator full control of the chalk flow (no matter which type is used) and the quality of the line produced. A chalker like the Streamliner with the variable flow control will likely end up helping an organization cut their marking chalk needs by as much as 1/3 while improving the quality of the chalk lines they apply. Definitely check out Groundskeeper U for lessons about Creating Foul Lines and about preventing bridging.